I have started my internship at swissnex China at the beginning of September and I keep discovering new things every days during my Chinese experience. In my first weeks, I have especially noticed things such as the massive size of the city (around 150 towers taller than Switzerland’s highest one…), the fact that you have to fight to get in or out of the metro (you really do), that my life expectancy when crossing the road is much lower than in Switzerland, that the food is cheap and good, etc. When I got used to those changes (the most obvious ones), I have started to discover new smaller things. For example, when I was strolling around Shanghai’s streets, I started to see some people facing their phones and speaking to it or others shaking it compulsively… I started to wonder what were these people doing?! I quickly got an answer to my questions: WeChat. This mobile application is the Chinese version of Whatsapp, which has some special features that the Western version doesn't have (yet?). First you have the voice messages, which allow the users to send direct vocal texts to their friends (which explained the people facing the phone), then you have the “look around” option which allows you to check other WeChat users using this option in a large perimeter around you (around 1km): Check their pictures and if you feel like it, entering into contact with them by sending a greeting. Last but not least, you have the “shake option” which will look for other people shaking their phone at the same time, for you to chat with them (which explains the compulsive shakes). With this application, nobody can complain anymore that it is hard to get in touch with locals when you know there are around 200 millions users worldwide! During my first days here, I went, like many foreigners, to IKEA to buy my bed sheets, towels, pillows, etc. After realizing I forgot to buy most of the things I need and because I was not very up to go for a new trip to IKEA (you can count 1 hour of metro for the round trip), I asked my ABC (American Born Chinese) flatmate where I could buy things I need in the neighborhood. His answer: “Check on Taobao!”. Taobao is the Chinese version of Amazon, which is widely used in China and where you can find approximately anything you need. 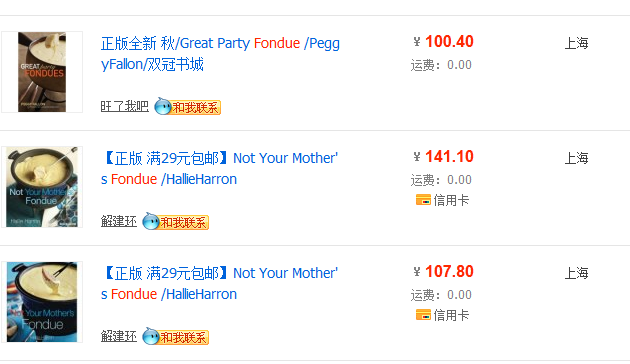 To illustrate it, I recently thought about organizing a fondue with some Swiss and Chinese friends. Where to find the Cheese? Where to find the “caquelon”? Answer: “Check Taobao!”. At my big surprise, I could indeed find all the cheese needed or great Swiss style caquelon on this website. (And I have to thank two friends from Switzerland who kindly brought me some Swiss white wine bottles when visting me). Shanghai (and China) being so big and the culture being so different from Europe, I will for sure keep being surprised by new things on a regular basis!